If you've ever taken primary flight lessons, you know them, those funny memory aids we all know and use. I personally can't shut down my 235 without mentally going over the REMMM checklist taught to me by my first CFI back in 1996. Sure, if I just begin shutting things off, I will eventually get the radios, electricals, mixture, mags and master in the right positions to make the big spinning metal thing out front stop attacking the wind. First there are two old standbys: CIGAR – which helps lots of us remember Controls check, Instruments set, Gas (proper tank, pump on, etc), Attitude (flaps, trim, etc.) and Run-up. And who can fly a retractable without GUMPS – Gas, Undercarriage (landing gear down), Mixture set, Prop set and Switches (lights, pitot heat, etc.). If IFR and nearing your destination, try WIRETAP – Weather, Instruments set, Radios tuned, Elevation (check final approach fix altitude), Talk to ATC, Altitudes (for decision height) and Procedure (for missed approach). And once you land safely, don't forget MIDGET – Master off, Ignition off, Doors/windows locked, Gust lock installed, ELT off, Tiedown plane. TOMATO FLAMES – Tachometer, Oil pressure, Manifold pressure, Altimeter, Temperature sensor (liquid-cooled), Oil temperature (air cooled), Fuel gauge, Landing gear position, Airspeed indicator, Magnetic compass, ELT, Seat belts. That's all for tonight, now it's time to go run my personal bedtime checklist. It involves a toothbrush, a toilet, and...oh, never mind. In an attempt to uncover at least one shred of good news in the airline sector, Airplanista's editorial team went out to locate a top executive from the industry to try and cast a positive light on an otherwise dreary airline picture. As many of the larger "legacy" carriers continue to push passengers away with poor service and unpredictable pricing schemes, we at Dano Airlines are extremely proud of our 100% passenger satisfaction rate! That's right, since inception in October, 2007, not ONE single passenger has complained about anything on any Dano Airlines' flight. We challenge our competition to match our unsurpassed passenger satisfaction rating. Go ahead, we'll clean your clock. (1) We fly when our passengers need to fly. There are no departure monitors in our terminal/hangar, only a friendly face waiting to welcome you aboard when you damn well please. (2) We serve the finest in bottled water, absolutely free, along with tasty Clif bars for all passengers and crew, again, without a crazy "snack food access" fee. (3) There are no security hassles, and you never have to take your shoes off to fly Dano Airlines. Our passengers are our friends, we love you, and that's why you are treated like family. (4) We land where you want to land. Let's say you have a business meeting in the countryside, far away from any "hub" or "spoke". While the "Bigs" force you to fly to a huge, congested airport, rent a car and drive for a couple of hours, those lucky souls on Dano Airlines will land at a quiet municipal airstrip just a couple of miles from their meeting. Try getting that kind of convenience from the other airlines. (5) We don't charge anything for any of your luggage, nothing, not a dime. In fact, our flagship is equipped to carry three passengers and a crew of one, full fuel and still have room for each person to carry 35 pounds of their crap on board. 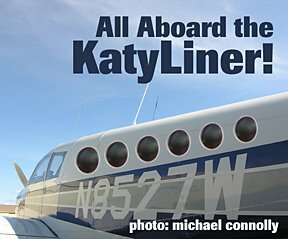 As you can see, flying aboard a KatyLiner on Dano Airlines is not only easy, affordable and hassle-free, it is also much more pleasurable than flying with those other guys. While they are rocketing along up in the flight levels, your Dano Airlines Captain powers back our luxurious Piper Cherokee 235 aircraft to save the environment, cruising at under 12,000 feet so our passengers can get a nice scenic look out the window. So the next time you are frustrated with being herded through the sky like cattle, sitting lost on the tarmac for hours while the lavatory overflows, or being crammed into a coach seat that gets smaller each day, maybe you should book your next flight on Dano Airlines. We really, really like to fly, and we'll get you there with a smile on your face. Of course, the above is complete BS, and I am not, repeat NOT in the airline business. I'm just one little part 91 private pilot who is doing the only thing anyone can do to beat the airlines at their own game, and that is to get a pilot's license, buy your own plane, and do the flying yourself. I do not charge people for flights, we split the gas however many ways there are butts in seats, just like every other private pilot does. But when you really compare flying yourself versus being herded by the big carriers, on many, many shorter legs into small fields, or flights when schedule can be more leisurely...GA wins every time.